So tasty, you can pretend it's unhealthy! 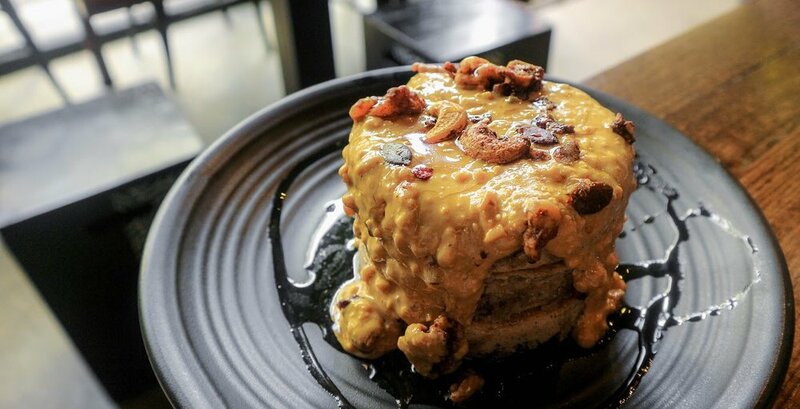 Do you want to try the most delicious pancakes in Sydney? Every pancake fanatic and sugar-free enthusiast NEEDS to make a stop here at least once in their time. Hale & Hearty is the ONLY place for the alternative eaters, the conscious eaters, the eaters that are given options and no restrictions, where substitutions are the menu! Think natural sugars, gluten-free flours, organic and ethically sourced produce... and NO COMPROMISE on flavour! I feel so fortunate to have their cafe in my own backyard. No matter the occasion, if I want a meal that will make me feel good I just walk the five minutes and here I am. Who says you have to drink a latte with dairy milk?! With an array of milks available now from almond to macadamia, Hale & Hearty have chosen coconut milk as their signature mixer. Sweetened with a hint of maple syrup, any drink hot or cold, makes for a perfect accompaniment to any meal, or on its own as an instant refresher! With dairy free coconut yoghurt, walnuts & banana, this stack was texturally insane! Soft pancakes, fresh and creamy bananas, and crunchy walnuts - what more could you want? Why... peanut butter of course. After my repeated visits to Hale & Hearty it is safe for you to assume that I've never had a bad visit there, and neither will you. If you appreciate healthy, organic, and healthy food with a spoonful of hearty philosophy, this is the place you want to be. Read my Zomato reviews! They're better than the rest! Every pancake fanatic and sugar-free enthusiast NEEDS to make a stop here at least once in their time! Hale & Hearty is the ONLY place for the alternative eaters, the conscious eaters, the eaters that are given options and no restrictions, where substitutions are the menu! Think natural sugars, gluten-free flours, organic and ethically sourced produce... and NO COMPROMISE on flavour!